panel discussion. All photos by Tracy Kumono. 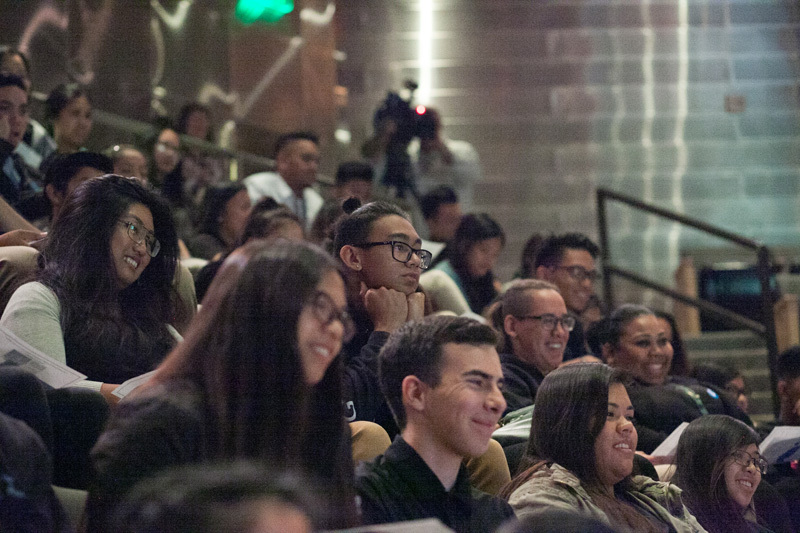 On May 17, the Japanese American National Museum partnered with the Smithsonian National Museum of American History to host a National Youth Summit on Japanese American incarceration in World War II. 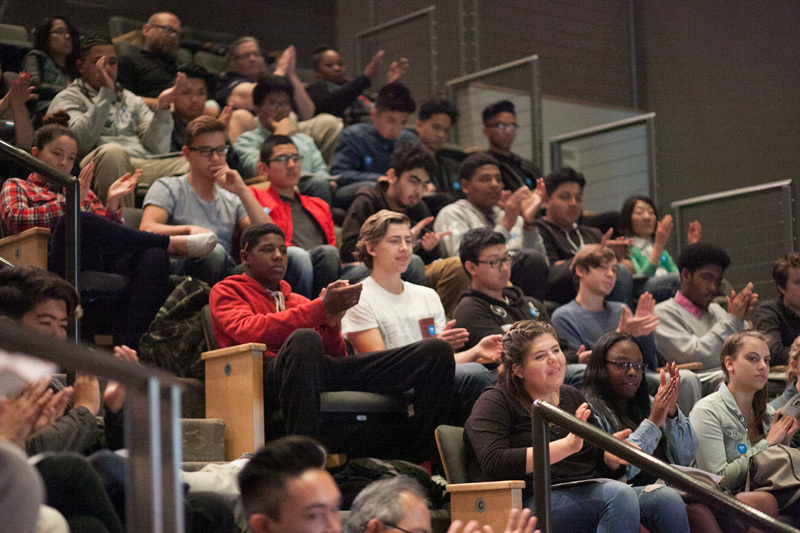 Over 3,600 students and teachers from 36 states and three countries tuned in to the live webcast of the event! In case you missed it, the program is now archived and available to watch online. In addition to the panel discussion here in JANM’s Tateuchi Democracy Forum and its webcast, we also hosted a simultaneous web chat where students enthusiastically checked in and asked some very thoughtful questions. There were so many questions that we were not able to answer all of them during the time allotted. Thanks to this blog, however, we now have a chance to follow up with our curious viewers and answer more of their questions. JANM’s Curator of History, Dr. Lily Anne Welty Tamai, was on hand to answer questions about the Japanese American World War II incarceration. Caroline asked: How were Japanese Americans treated differently from Jews during this time? Dr. Tamai: The World War II experiences of the two groups were very different. Technically, both the Nazi and the American camps were concentration camps, meaning they were used “for the detention or imprisonment of aliens, members of ethnic minorities, or political opponents.” However, after the war, the term “concentration camp” became associated most strongly with the Nazis, who used their camps to systematically execute Jews and other minority groups. Although Japanese Americans were imprisoned without due process, the War Relocation Authority camps were NOT death camps—they met the prisoners’ basic needs for food and shelter and allowed them to work, go to school, and live with their families for the most part. The DC Area asked: What happened to Japanese Americans who resisted incarceration? Dr. Tamai: There were several acts of resistance against the incarceration, which led to arrests and four subsequent Supreme Court cases (Gordon Hirabayashi 1943, Minoru Yasui 1943, Fred Korematsu 1944, and Mitsuye Endo 1944) that questioned the constitutionality of various aspects of President Roosevelt’s Executive Order 9066. In the first three cases, government authorities misled the court by exaggerating the military’s estimates of the security risk posed by Japanese Americans. 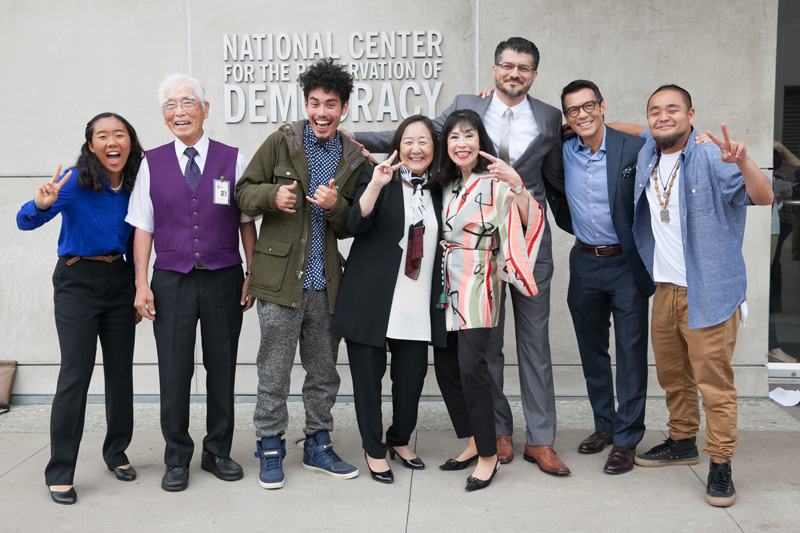 All convictions were overturned 40 years later thanks to the leadership of the Nisei and Sansei generations, who achieved historic court victories that paved the way for the Redress Movement. This in turn led to the passage of the Civil Liberties Act of 1988, which granted a formal apology and reparations to Japanese Americans. Caroline asked: Did any other Americans try to stand up for Japanese Americans’ rights? Dr. Tamai: After the bombing of Pearl Harbor, the Japanese American community was perceived to be allied with Japan and thus, it was extremely unpopular to stand up for them. Several notable people did, however. Clara Breed, a librarian in San Diego, wrote many letters to her former students who were incarcerated at Manzanar War Relocation Center. For more information, see Joanne Oppenheim, Dear Miss Breed: True Stories of the Japanese American Incarceration During World War II and a Librarian Who Made a Difference (Scholastic Nonfiction, 2006). There was also a Mexican-Irish teenager named Ralph Lazo who decided to show his support of his Japanese American friends by joining them at Manzanar during the war. Ralph Carr, former governor of Colorado, welcomed Japanese Americans who wished to resettle in Colorado after the war—an unpopular move that cost him his bid for the US Senate. American Friends Service Committee (the Quakers) also gave public support to Japanese Americans who were resettling. San Francisco–based civil rights attorney Wayne Collins helped nearly 5,000 Japanese Americans reinstate their US citizenship after they had been coerced into renouncing it. He also served as defense attorney for Fred Korematsu, Mitsuye Endo, and Japanese Latin Americans who had been extradited from Latin America and imprisoned in US Department of Justice camps. Anonymous asked: Why didn’t they send Japanese Americans back to Japan? Dr. Tamai: By 1942, nearly two-thirds of the Japanese American community had been born in the US, making them US citizens. Although most had family members who were still in Japan, many had never even been there, and therefore going “back” was not an option. For the first-generation Japanese immigrants who made up one-third of the community, many had already established themselves in the US—they were legal residents; they owned businesses, farms, and homes; and their children were American citizens. The US government was not in a position to deport an entire ethnic community. 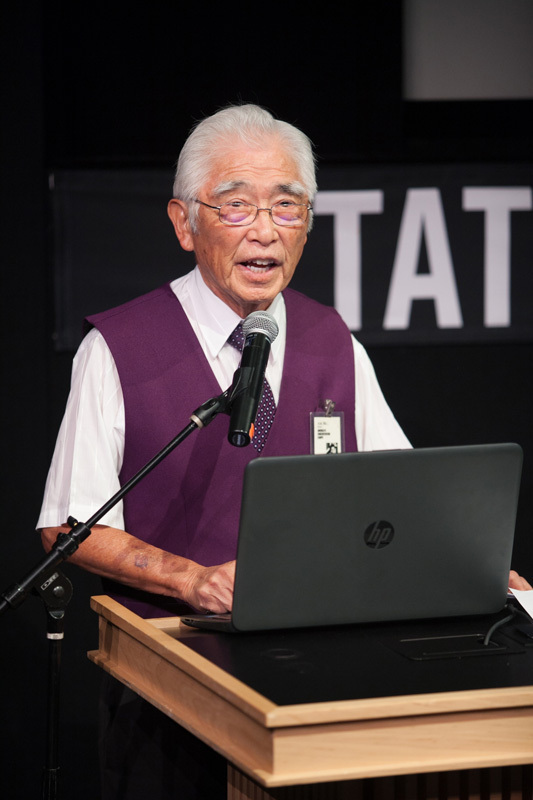 During the first part of the program, students heard from JANM volunteer William “Bill” Shishima, who talked about his childhood incarceration at Heart Mountain, Wyoming. The students responded very positively to his story and asked him a few more questions via the web chat. NadeShot asked: What was it like saying goodbye to your friends and not knowing when you would be back? Bill Shishima: It was very short and sweet. Basically, we just said goodbye and we didn’t know where we were going or for how long. Cate asked: Did the formal US apology help you at all emotionally? Shishima: Yes, I was shocked that the country said that they were sorry we were incarcerated during the war. It takes a great country to admit a wrong to their citizens. I donated my $20,000 reparation money to the Japanese American National Museum, which exists to tell the Japanese American incarceration story so that it will never happen again! National Youth Summit presenters celebrate a successful event. L to R: Mariko Rooks, William “Bill” Shishima, Kane Tenorio, Lori Bannai, Karen Korematsu, Hussam Ayloush, David Ono, and G Yamazawa. A huge thank you to everybody who participated in this year’s National Youth Summit! In closing, we’d like to leave you with a link to the rap song we played to kick off the program. It’s called “9066” and it’s by “Kamikaze” Kane Tenorio. You can listen to it here. You can also read about Kane and his family here. Enjoy!